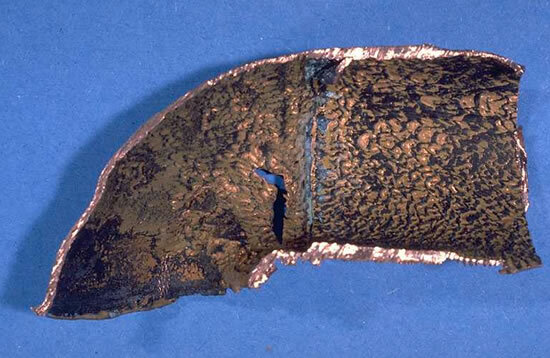 "Horseshoe" type erosion-corrosion damage in a copper pipeline. 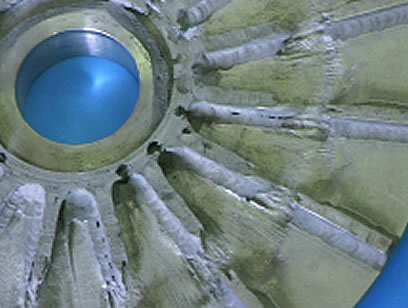 Cavitation of a nickel alloy pump impeller blade exposed to a hydrochloric acid medium. Most metals and alloys can be affected, particularly soft materials (e.g. copper, lead, etc.) or those whose corrosion resistance depends on the existence of a surface film (aluminium, stainless steels). Turbulence phenomena can destroy protective films and cause very high corrosion rates in materials otherwise highly resistant under static conditions. In the laminar flow regime, the fluid flowrate has a variable effect depending on the material concerned. 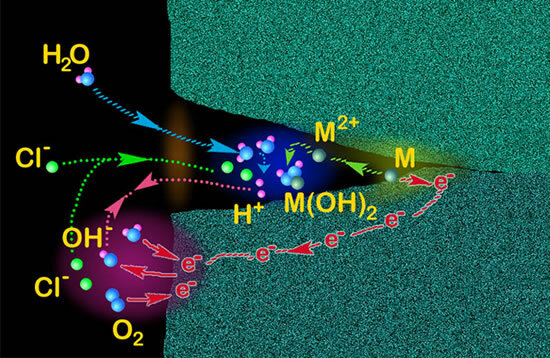 In two-phase liquids (containing suspended solid particles or gas bubbles), the impact of the particles can damage or even eliminate the protective layers or passive films that are normally stable in the absence of particles, and the local corrosion rate is then markedly accelerated. This phenomenon is called abrasion-corrosion. Means of limiting erosion-corrosion and abrasion-corrosion : choose a more resistant material , improve the Plant design, adjust the medium (control the oxygen content, lower the temperature, use inhibitors, filter out solid particles, etc.). 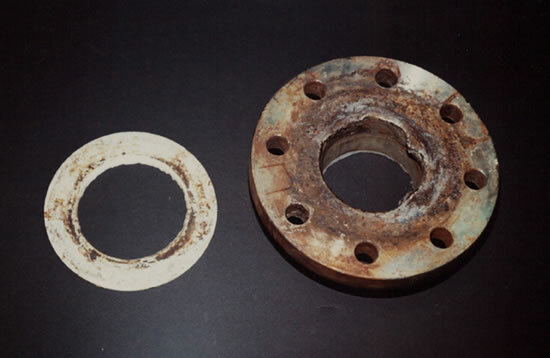 Cavitation-corrosion is particular form of erosion caused by the "implosion" of gas bubbles on a metal surface. It is often associated with sudden variations in pressure related to the hydrodynamic parameters of the fluid (e.g. hydraulic turbine blades, propellors, stirrer blades, etc.). A regular hydraulic regime in the fluid is extremely important. A good surface condition decreases the number of potential sites for the formation of vapour bubbles. An increase in fluid pressure is often sufficient to maintain a single phase fluid, thus avoiding the formation of vapour bubbles. Plastic or rubber coatings have often proved to be effective, although the problems of adherence between the coating and the metal are frequently an obstacle.